It's official. February is here. Today is the 5th. It's officially closing time for the apartment life today, even though keys were handed over this past weekend. I can't help but reflect on the significance of this date - February 5th - and I like it. Chapter closed. New one beginning. Praise the good Lord for every moment and every breath in between! 1. Kisses or hugs? HUGS. I come from a family of huggers. I hug you after I've met you the first time. I like hugs. They just feel nice. 2. Candy or flowers? Flowers. If you must spend the money on one or the other, please do not add to my waistline. Please. 3. Baking or cooking? Both. For holidays then baking. 4. Do you remember your first kiss? Yes. 5. Favorite color of roses? Bright pink or orange & red, but I have a major soft spot for a variation of red roses together. 6. Conversation hearts, yes or no? NO. Why do they even exist? I would understand if they tasted good. But, they taste like chalk! 7. Do you leave love notes? I've been known to. If I feel it, I write it down. Don't ever miss an opportunity to tell someone how you feel about them. 8. Do you decorate for Valentine's Day? I have before/used to. I will again when I have children. 9. Red or pink? Depends on the item, outfit, holiday, event. 10. Milk, white, or dark chocolate? Milk or dark chocolate preferably. White chocolate should be saved for emergency situations only. Emergencies like when the world runs out of regular chocolate and cocoa beans and therefore all we have is a very non-chocolate-ly substance commonly referred to as white chocolate. 11. Do you believe in love at first sight? No. Infatuation and lust at first sight, yes. 12. Do you give humorous or serious Valentine cards? Largely depends on recipient and my mood when buying the card. I switch it up. 13. Favorite chick flick or romantic movie? 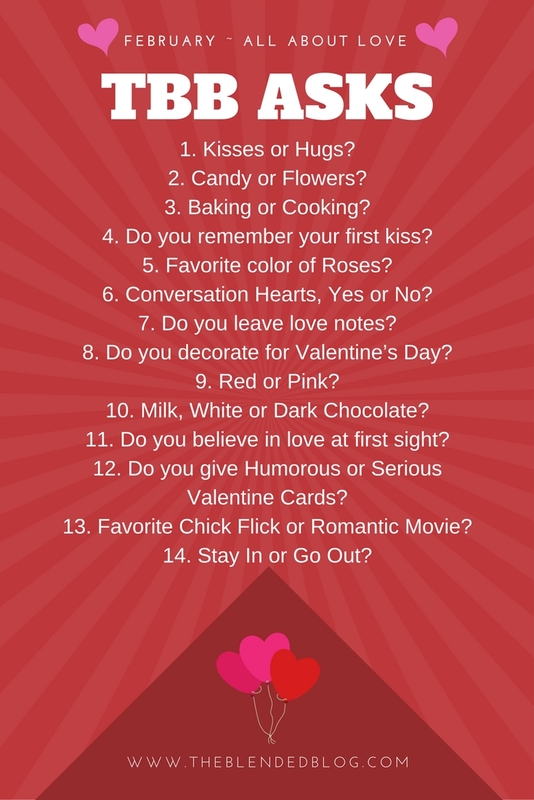 The Notebook, Moulin Rouge, Valentine's Day is pretty good too as cliché as it is for this question. What are some things you prefer for Valentine's Day? Do you get into celebrating the Hallmark holiday because you love it or because it's expected? Are you anti-Valentine's Day? I'm curious!